Clever tissue box cover from HapiStitcher. Now isn't this clever? 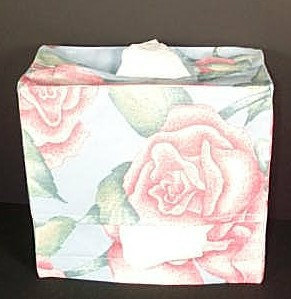 A double-decker tissue box cover with new tissues on top and space for used tissues in the bottom. How neat and discreet! Called Hankie Pankie Two, this tissue box cover provides "a better way to dispose of used tissues during cold and allergy season" and is available at HapiStitcher, a recently opened Etsy shop. In addition to this style, there is also the original Hankie Pankie design and both are available in colors and prints to match any decor. FYI: Mother's Day is only two months away - for less than $10 including shipping, wouldn't this be a nice (and affordable) gift? HapiStitcher also has several other cute items listed with more coming soon. In fact, I'm anxiously awaiting the ereader covers made from REAL hardback books. How do I know all this? Well, because HapiStitcher is my mom. So go check out her Etsy shop, ok?